Project of the Week ...Let Us Build One for You Professional Integrity! If you are uncertain as to what size garage you need, our Layout Page may be of some help. Welcome to HUDOCK GARAGES. If building a garage is in your future, we should be too. Our goal is to provide our clients with a strong responsive construction team that knows how to work together to get the job done correctly, on time, within budget and with pride. 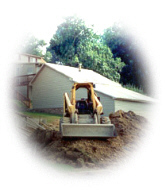 Hudock Garages offers a complete range of services-from preliminary planning and budgeting, to site selection, permitting, excavation, and construction. 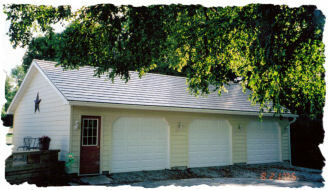 We welcome the opportunity to build you the garage you have always wanted. 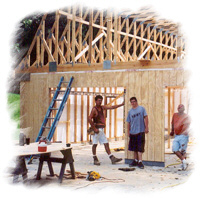 Please review the information on our web site and contact us if we can help you plan for your future building project. 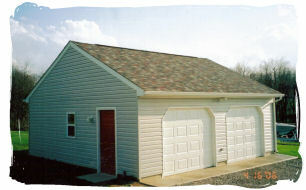 You Can Own a Garage Like This for Only $162.00 Per Month. * Click here for details and to see if you Qualify.